It should come as no surprise that many staff at the Aquarium are keenly interested in underwater technology and exploration. 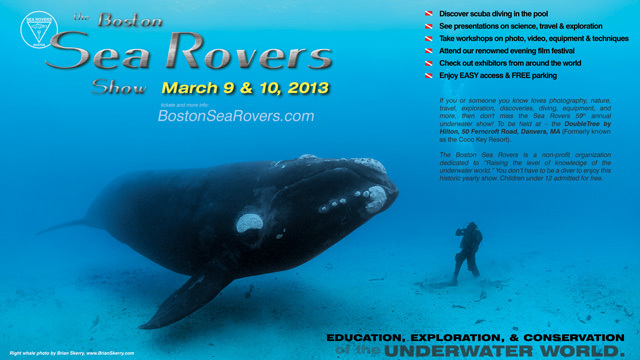 The Boston Sea Rovers show, which is happening March 9 and 10 this year, brings together underwater explorers, scientists, filmmakers, photographers and enthusiasts from around the world, who present their latest exciting discoveries and creations to the public. In the past, notables such as Jacques Cousteau, Stan Waterman, Dr. Sylvia Earle, Dr. Robert Ballard and Brian Skerry have graced the show with their incredible works. Of course, you don't need to be a professional scuba diver to attend. This event is open to the public as well. Whether you're a diver or not, you can learn about the underwater world through very visual and educational 45-minute presentations, an exhibit hall filled with manufacturers, travel companies and dive organizations and a Saturday evening film festival. A FREE diving workshop is being presented on Saturday, March 9, for anyone interested in seeing what scuba diving is like first-hand. If you’re already a certified diver, there will be a rebreather workshop offered on Friday, March 8, and many other workshops that include photography, videography and public safety diving. This year’s show will take place at the Double Tree by Hilton in Danvers, MA. For more information, tickets and show details, visit the Boston Sea Rovers website. Members, use the code NEAQ2013 for $5 off tickets!